If you’re a clueless adult . . . 1.) ask how many children’s books she writes a day. 2.) ask when she’s going to grow up and write real books. 3.) ask if she’s written anything you would’ve heard of. 5.) …for all 18 of your grandchildren/nieces/nephews/hamsters. 6.) ask if she makes enough money to support herself and family. 7.) ask why she picked such a terrible illustrator for her picture book. honest opinion – then get huffy when she does. 9.) ask if she’ll introduce you to her agent/editor – then get huffy when she doesn’t. 11.) … and why you can’t find it at Costco. 12.) never buy her books (or any books, for that matter) from an independent bookstore. 13.) complain that the local independent bookstore doesn’t carry her book, but don’t bother to ask the store to order it. 14.) tell her you’d write children’s books too – if only you had the time. 18.) if she answers Yes to #17, refer to #’s 4 and 5. 19.) ask how much she pays the publishing companies to publish her books. 21.) call the children’s literature genre ‘kiddie lit’. 22.) describe her picture book as ‘cute’. 23.) don’t take her humorous books seriously. 24.) ask when she’s going to write a Newbery medal-winner. 25.) ask when her book will be made into a movie. sells it, you’ll be happy to share a small percentage of the profits with her. If you’re a kid . . . 30.) write a fan letter addressed to her as Mr. Lee Wardlaw. 31.) write a fan letter begging her to please, please, please write back – but forget to include your name . . . 32.) … and your return address. 35.) don’t read any of her books before she visits your school. 36.) during her school visit presentation, yawn. Loudly. 37.) during her presentation, fall asleep. 43.) passing gas (and laughing uproariously about it). 44.) mispronounce her last name as Wardlow, Weirdlaw, Warlock, or Warthog. 45.) call her Lee Anna. 46.) ask her to autograph a book written by someone else. 48.) ask her to autograph a scrap of paper ripped from your notebook. 49.) encourage all your friends and all their friends to rush up with scraps of paper to be autographed, too. 51.) …and lives three states away. 52.) forget about the autographed paper scraps and allow them to slip from your binder and litter the school parking lot near her car where she can’t possibly miss seeing them as she’s leaving for the day. 53.) ask her to autograph body parts. 54.) jiggle the table while she’s trying to autograph books so that her signature gets wormy. 57.) ask her how old she is. 58.) when she tells you, stagger backward and clutch your heart. 62.) when she asks if anyone has any questions, raise your hand and tell her about the day your dog ate a jar of sun-stroked mayonnaise and barfed on the living room rug. If you’re a teacher/librarian . . .
profession but don’t offer to pay her a professional fee. 71.) and store-bought chocolate-chip cookies. 72.) at lunch time, offer her a Dixie cup of lukewarm water and inform her that there’s a fast food joint down the street where you suppose she can buy something to eat. 73.) don’t bother to learn anything about her before she comes to visit your school. 74.) don’t bother to share her books with staff and students before her visit. 75.) don’t have the room ready for her presentation. 76.) rush off to a meeting so that she has to introduce herself. 78.) …then leave the room. 81.) if the students do #’s 36-43, don’t intervene. 83.) …or gossip with other educators. 84.) during her presentation, make sure the microphone makes intermittent buzzing, crackling or shrieking sounds. 85.) forget to order her books for the book sale/autograph session. 86.) forget to have her check ready at the end of the day. 87.) complain about the content of her books without having read them. If you’re an editor/publisher . . . 88.) sit on her manuscript for 18-24 months, then reject it with a form letter. 92.) then go on vacation. 93.) push the pub date of her book back two years. 94.) right before her book is released, move to a different publishing house. 95.) forward her fan mail six-twelve months late. 96.) forward bad reviews three months early. 97.) allow her book to go out of print after only one year . . . 98.) . . . without telling her so that she’s left with only five copies. 101.) … but teaches them kids today plenty of good morals. 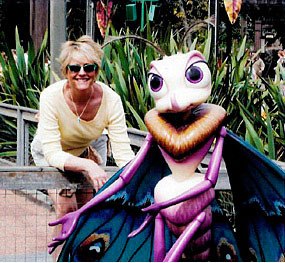 Ms. Lee Weirdlow is the author of more than two dozen books for young readers, including the novels 101 Ways to Bug Your Parents and 101 Ways to Bug Your Teacher (both Dial/Penguin). Lee claims to have personally experienced every single one of the 101 ways listed above – twice.